As a secondary school teacher-librarian, the opportunity to work in close collaboration with nearly every content area sounded like a dream come true—albeit one that might be difficult to acheive. Like many librarians, I often find myself asking: “How may I effectively communicate what I have to offer and serve as many teachers and students as possible?” The answer to that question came through an unexpected source—a tool I had been using for over a decade—Skype. In the Spring of 2017, at a professional development event, I was introduced to the online Microsoft Educator Community, (MEC). As I explored the website, “Skype in the Classroom” caught my attention; I knew the application well. As a former teacher at an International school in Asia for 15 years, I had used Skype daily when away from home. Leaning toward the familiar, I dove in, watched videos, took tutorials, and read testimonials. I learned that there were countless others using Skype as a professional tool and as a result they were connecting their students to experts all over the world. I discovered the “Five Ways to Use Skype in the Classroom” (see box) and began dreaming up ways to apply each application in my school library. Students take part in a Skype session. To my delight, a few teachers were willing to give it a try (students were naturals), and word spread quickly. One by one teachers were collaborating with me to use this tool to connect to relevant curricular tie-ins. The result can only be described as library magic—engaged middle schoolers meeting authors, illustrators, graphic designers, curators, scientists, park rangers, and multiple others—building upon their previous knowledge, and asking questions. What happened at Baker Middle School in Tacoma, WA, can easily be replicated; success using Skype can happen anywhere. Here’s how we got started in our school, and a few tips to get in going in yours. Our school district participates in a middle school “Battle of the Books” reading competition. During the 2017/2018 school year, my goal was to recruit as many students as possible to participate. I knew connecting students with authors would encourage them to come on board. Most of the authors and illustrators on our “Battle” list of 10 titles had Twitter accounts, which I used to message or tweet them directly. For those not on Twitter, I went directly to their websites and sent them an email. I introduced myself and my students, explained that we had read one of their titles for our district competition, and that we would love to connect and talk about the book. I received an astounding number of responses, which lead to a number of Skype calls with some incredible people: Sharon Draper (Stella by Starlight), Steve Sheinkin (Undefeated), Chris Grabenstein (Escape from Lemoncello’s Library), Marie Lu (Legend), Jason Reynolds (Ghost), Shannon Hale (Real Friends), LeUyen Pham (Real Friends), Deborah Heiligman (Vincent and Theo), and Brian Mealer (The Boy Who Harnessed the Wind). To get started, set up a Skype account at www.skype.com. Access a webcam or use a computer with a built-in webcam. Using the Skype system test, test the audio and video connections. Request your guest’s Skype user name and add it to your Skype contacts. Agree upon a date and time and schedule a test call to double check all is running smoothly. Determine who will call and who will receive the call. Show up for the appointed time! Prepare students for the visit by exploring the topic, reading the book, and leading discussions with them to develop questions and maximize the learning. Set up a “question” chair. The closer the speaker is to the camera and microphone, the better. Distribute a post-session survey link and send a thank you note from students. Gathering data on learning and sending appreciative messages to Skype guests are tools for connection and reflection. Mystery Skype Two classes connect over Skype and use teamwork and maps to guess the location of the other class. Similar to the game Twenty Questions, each team has to come up with the best questions to discover the location. The team that guesses first is the winner! Guest Speakers Professionals Skype in on a topic they have expertise in, deepening students’ learning while participating in an engaging way to present information. A perfect opportunity for students studying a specific topic to ask the questions they may have. Virtual Field Trips Students can visit places via Skype with an expert, generally complete with tours, exhibits, artifacts, and other displayed and described physical examples. Skype Lessons Students participate in a virtual lesson taught by a teacher, professor, or other professional. Typically, they learn along with another class. Students may ask the instructor questions and engage in learning activities with them. Skype Collaborations Classrooms in different schools work together on the same project or cause. These are long-term activities in which students share their work through sharing files and communicating online. They Skype to help one another, convey findings, engage in group meetings, and progress check-ins and presentations. We were able to meet local author Marissa Meyer (Cinder) in person, as she was our keynote speaker for our district Battle. Katherine Applegate (The One and Only Ivan) and Marc Barnett (The Terrible Two ) were not able to Skype with us, however, we were able to make connections to their books in other ways. Barnett sent us a handwritten letter wishing us luck in the competition. As Applegate’s Ivan the gorilla had spent 27 years in Tacoma, the author encouraged us to connect with our community to learn more about him. We reached out to his veterinarian of 25 years, Dr. Michael Jones, who agreed to come to the library and speak to us about Ivan. As word spread and more students joined in the reading competition, the Skype sessions grew exponentially. The session with Jason Reynolds drew the highest attendance. Students from all grades, even those who were not officially signed up for the reading competition, came to “meet” Reynolds, hear about his journey to becoming an author, listen to him read from Ghost, introduce his new book, and answer their many questions. What was scheduled to be 15-minute session lasted 45 minutes. The feedback from students, teachers, staff and administration was tremendous, but more importantly, our students’ interest in reading noticeably increased—for both avid readers and those who didn’t often visit the library, and the experience encouraged conversation about books and authors. We didn’t stop there. 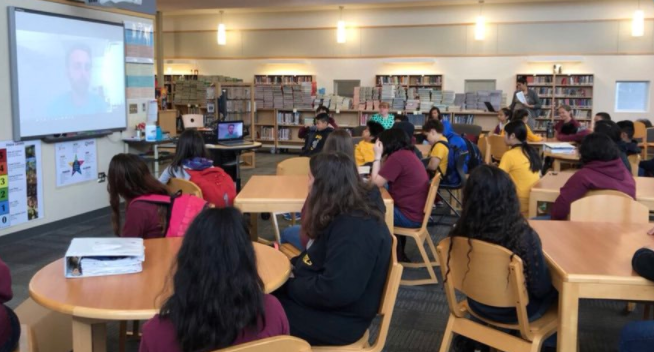 In collaboration with a variety of content area teachers, the Baker Middle School library applied all five of the Skype uses as outlined on the MEC site. In collaboration with our Spanish language teacher, multiple Mystery Skype sessions were arranged with other Spanish speaking classrooms from Argentina to Pennsylvania. The students, unaware of the location of the other classroom, had to work together to solve the mystery. We delegated jobs such as recorders, map navigators, team captain, and moderator. The students then worked together to form questions that eliminated as many locations as possible. The sessions were conducted entirely in Spanish. Our students were thrilled with the challenge of this activity, and, in feedback, expressed their appreciation for the opportunity to meet distant students in such an engaging way. A phenomenal resource for connecting with classrooms all over the world is a Facebook group called Skype in the Classrooms Enthusiasts. Our author visits are a perfect example of using the Guest Speakers aspect of Skype in the Classroom. The 20 author and illustrator Skype sessions we held during the year were conducted differently than the other Skype events as participation was voluntary; the students attending were across classes and grade levels and sessions took place during their free time. The more students who had read the featured book and/or other books by the author, the deeper the insights, questions, and conversations. Authors often commented on how inspiring it is to connect with their readers. Re verse field trips offer the best of both worlds: no travel, no permission slips, no prearranged busses and best of all- no cost. We took roughly a dozen of the Virtual Field Trips. One example was a “trip” with all the 6th grade science classes to the DINO National Park in Utah. As a grade level, the students were nearing the end of their unit on erosion and fossils. Using what they knew already they wrote down their wonderings about fossils as a pre-Skype assignment. During our Virtual Field Trips, we met park rangers, took in breathtaking views of the Utah terrain, received a tour of some of the exhibits, and learned about fossils from a paleontologist. One park ranger shared pictures of the fossil dig sites, highlighting several artifacts. As a wrap up exercise, he answered dozens of the students’ prepared and new questions. In English Language Arts, 8th grade students study World War II. The focus of much of the literature is on the Holocaust and aspects of genocide. In Louisiana, the WWII Museum offers Skype Lessons, with one of their museum historians. Students participated in a class discussion. Structured notes were provided to document the learning and lead the whole- and small-group discussions. The museum curator incorporated quotes from various period sources to propel the lessons, along with maps, time lines, and photographs. Remember the book competition that started it all? We were able to use Skype Collaboration with students from one of the middle schools across town, one of our “Battle of the Books” competitors. Students from each school met as teams in the library to brainstorm questions about the book/s they read. Each Skype session with another team included a book discussion followed by questions about the titles written and asked by students. This was a thrilling twist on studying up for the reading competition. The students enjoyed getting acquainted with their peers in other schools and connecting over their likes, dislikes, and insights into books. Kristin Fraga Sierra is a secondary teacher-librarian at Tacoma Public Schools in Washington state. She served as the Broadcast teacher from 2015-2017 and the teacher librarian/media specialist at Baker Middle School from 2015-2018. A Project Lit Book Club Chapter Leader/enthusiast, Microsoft in Education (MIE) expert, and Makerspace veteran, she loves connecting with others and creating connections for others. Beginning Fall 2018 she will be teacher librarian/media specialist at Lincoln High School in Tacoma, Washington. Follow Sierra on social media @lincolnabesread. Connect on Microsoft Educator Community: http://bit.ly/SierraMIE or by email: ksierra1@tacoma.K12.wa.us For more on Skype: Visit http://bit.ly/2018SkypeSierra for her Sway presentation on using Skype in the Classroom.